Wow—best description I can give. What made me pick this book up in the first place? Gut instinct was ruling the hand that day at the library sale. And don’t you just love it when you pick up a book and think, yeah, well it might be worth a read and then POW you fall in love with it? This book is stunning in an earthy but other-worldly way. Here is a story of a girl growing up in a village in a regional district of Thailand. Born with a sense that there is much more beyond the human form yet she is held tight to her human existence; First as a female child, then as wife and mother, by the controlling males of her world. Yet, with a patience and grace I can only dream of, she waits until she is freed from her hard life to seek nirvana in a harder life. Many women would live such a life in bitterness but Mae Chee Kaew didn’t. 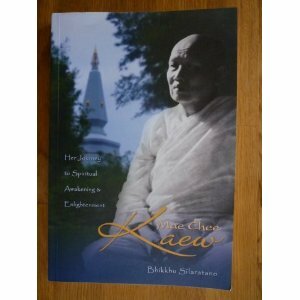 This story is a wonderful read for anyone understanding or having a curiosity about Buddhism, or to immerse themselves in the wisdom of a soul who lived here, on earth, such as Mae Chee Kaew. This book is a pick-up, read a bit, put-down, pick-up, read a . . . . . kind of book. I wanted to read until either my eyeballs burned out or the read was finished but forced myself to hold back—reading small sections at a time and then imagining myself living as she did. There were more than a couple of times when envy was so strong I would check my chin for drool. Now, please excuse me for I have some simple to study and patience to practice.